As seen in his game-by-game log, Carlino missed BYU's first 10 games this season before playing in the team's last 14 contests. He started off nicely from behind the arc, going a combined 17-of-33 (.515) in his first six games. After a 1-for-7 (.143) game January 5 at Loyola Marymount, Carlino resumed his hot three-point shooting over his next three games, hitting a combined 7-of-13 (.538). Admittedly, we're dealing with short sequences of games. 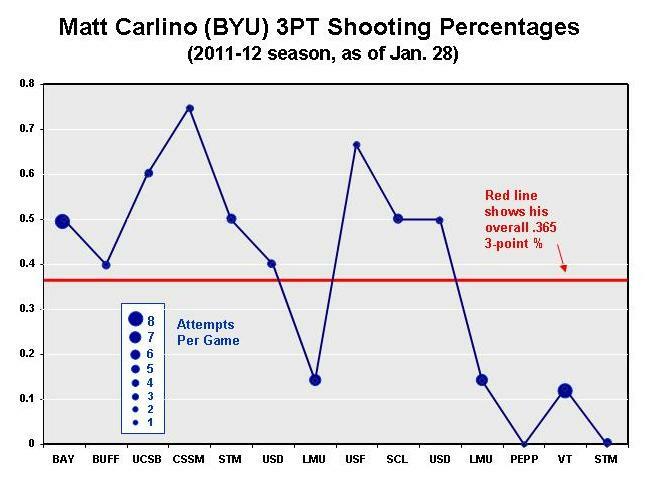 However, Carlino seems to get "stuck" either in sequences of hot shooting or of cold shooting. As a point of comparison, Creighton's Doug McDermott (whose three-point shooting I analyzed here) seems able immediately to snap back after a poor shooting night. Hence, at this stage of the season, Carlino appears to be more of a streaky shooter -- with both hot and cold spells -- than McDermott.